Kateri Tekakwitha, known as “Lily of the Mohawks”, was a young Mohawk woman who lived in the 17th century. The story of her conversion to Christianity, her courage in the face of suffering and her extraordinary holiness is an inspiration to all Christians. Saint Kateri Tekakwitha is the first Native American Saint in the United States of America and Canada. Her Shrine is located in Fonda, New York. This National Shrine was created to honor Kateri and the Native peoples north and south of the border, for it was here that she was baptized on Easter Sunday April 5, 1676, and lived her teenage years. Kateri was born in 1656 of an Algonquin mother and a Mohawk Chief in the Mohawk village of Ossernenon (modern day Auriesville) in upstate New York. When she was only 4 years old her parents and brother died of smallpox. Kateri survived the disease, but it left her face badly scarred and her eyesight impaired. Because of her poor vision, Kateri was named “Tekakwitha”, which means “she who bumps into things”. Kateri was taken in by her uncle who was bitterly opposed to Christianity. When she was 8 years old, Kateri’s foster family, in accordance with Iroquois custom, paired her with a young boy who they expected she would marry. However, Kateri wanted to dedicate her life to God by remaining single and offering her life to Jesus. When Kateri was ten, in 1666, a war party composed of French soldiers and hostile Natives from Canada destroyed the Mohawk strongholds on the south bank of the Mohawk, including Ossernenon. The surviving Mohawks moved to the north side of the river and built their fortified village about half a mile west of the present village of Fonda. Kateri lived in Caughnawaga, site of the present Shrine, for her next ten years. When Kateri was 18 years of age, she began instructions in the Catholic Faith in secret. Her uncle finally relented and gave his consent for Kateri to become a Christian, provided that she did not try to leave the Indian village. For joining the Catholic Church, Kateri was ridiculed and scorned by villagers. She was subjected to unfair accusations and her life was threatened. Nearly two years after her baptism, in St. Peter’s Chapel at the present Kateri Shrine in Fonda, she escaped to the Mission of St. Francis Xavier, a settlement of Christian Natives in Canada. The village in Canada was also named Caughnawaga (Kahnawake). Here she was known for her gentleness, kindness, and good humor. On Christmas Day 1677 Kateri made her first holy communion and on the Feast of the Annunciation in 1679 made a vow of perpetual virginity. She also offered herself to the Blessed Mother Mary to accept her as a daughter. 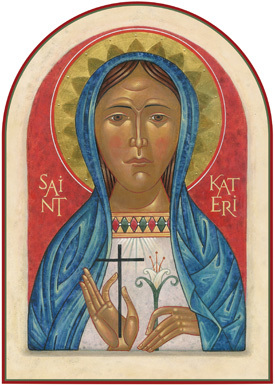 While in Canada, Kateri taught prayers to children and worked with the elderly and sick. She would often go to Mass both at dawn and sunset. She was known for her great devotion to the Blessed Sacrament and to the Cross of Jesus. During the last years of her life, Kateri endured great suffering from a serious illness. She died on April 17th, 1680, shortly before her 24th birthday, and was buried in present day Kahnawake, Quebec, Canada. In Canada her feast day is celebrated on April 17th, and on July 14th in the United States. Tradition holds that Kateri’s final words were. . .“Jesus, I love you”, after which she embraced her creator for all eternity. Witnesses reported that within a few minutes of her death, the pock marks from smallpox completely vanished and her face shone with radiant loveliness. Before her death, Kateri promised her friends that she would continue to love and pray for them in heaven. Both Native Americans and settlers immediately began praying for her heavenly intercession. Several people, including a priest who attended Kateri during her last illness, reported that Kateri had appeared to them and many healing miracles were attributed to her. Fifty years after Kateri’s death the first convent for Indian nuns was established in Mexico and they pray daily for Sainthood for Blessed Kateri. Their prayers were answered on October 21, 2012 when Kateri was canonized as the first Native American woman to be honored with sainthood. Saint Kateri Tekakwitha, our elder sister in the Lord, discreetly, you watch over us; May your love for Jesus and Mary inspire in us words and deeds of friendship, of forgiveness and of reconciliation. Pray that God will give us the courage, the boldness and the strength to build a world of justice and peace among ourselves and among all nations. Help us, as you did, to encounter the Creator God present in the very depths of nature, and so become witnesses of Life. With you, we praise the Father, the Son and the Holy Spirit.